Bocce ball court construction drives revenue for a division of Brewer Landscape Construction. Brewer Landscape Construction has a separate division, Boccebrew Inc., for its bocce court installation business. What game does Pro Football Hall-of-Fame coach John Madden play when enjoying his outdoor living area? Not Madden NFL 13. He plays bocce ball. Dubbed “Italian bowling” by some, bocce is played on rectangular outdoor courts measuring 12 feet by 60 feet. The surface is hard-packed by using clay soil and oyster shell with a topping of oyster shell flour, limestone or decomposed granite. The construction can be as plain or as ornate as a client would like. Some courts are surrounded by 4-foot stone or brick walls; others feature outdoor lighting or trellises to reduce sunshine on the playing area. Thus, the design/build price can range from a few thousand dollars to tens of thousands of dollars. Brewer came to bocce court construction by accident. Over the years, Brewer has come to specialize in bocce court construction. “It’s really a central part of our business now,” he says. “The margins are good, and just as with any other business, the more complex and detailed the build, the more room to increase the margins. 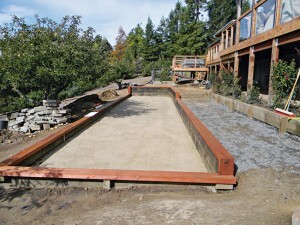 Why bocce court construction? According to the World Bocce League (WBL), more than 2 million Americans play bocce regularly and 25 million have tried it at least once. The WBL is working to introduce the game to youth and disabled veterans, to help stimulate a greater following. Bocce is now played in the Special Olympics and the World Corporate Games. Ingles is a freelance writer based in Columbus, Ohio.